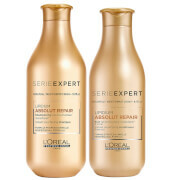 Recharge limp locks with the L'Oréal Professionnel Pro Fiber Re-Create Damaged Hair Shampoo and Treatment Duo, a reparative pair that work to cleanse, nourish and revitalise. Expect soft, shiny and healthy-looking results. 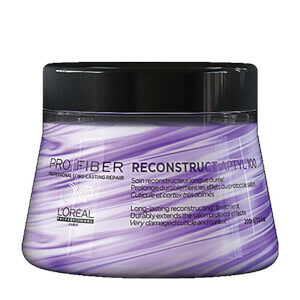 The innovative shampoo cleanses away dirt and impurities while smoothing and hydrating damaged hair from root to tip. 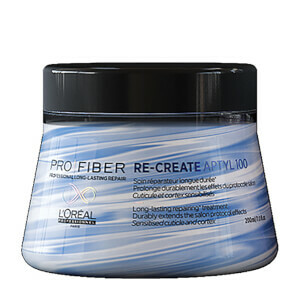 Providing long-lasting care for damaged tresses, it utilises advanced, professional repairing technology to eliminate weakening impurities from sensitised hair fibres. Enriched with nourishing Bergamot and White Amber, the restorative shampoo helps to replenish lost moisture and body while enhancing softness, plumpness and shine without added weight. 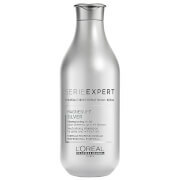 Shampoo: aplique o shampoo no cabelo molhado. Massaje até fazer espuma. Enxague. Em caso de contacto com os olhos, lave-os imediatamente. Tratamento: aplique no cabelo limpo. Deixe atuar durante 5 minutos. Massaje até fazer espuma. Enxague. 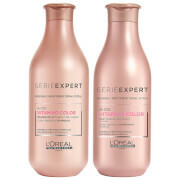 Shampoo: Aqua / Water, Sodium Laureth Sulfate, Coco-Betaine, Dimethicone, Glycol Distearate, Sodium Chloride, Ppg-5-Ceteth-20, Sodium Benzoate, Salicylic Acid, Polyquaternium-6, Carbomer, Benzyl Salicylate, Benzyl Alcohol, Limonene, Linalool, Hexyl Cinnamal, 2-Oleamido-1,3-Octadecanediol, Citronellol, Sodium Hydroxide, Citric Acid, Parfum / Fragrance. C187377/2. Treatment: Aqua / Water, Cetearyl Alcohol, Aminopropyl Triethoxysilane, Paraffinum Liquidum / Mineral Oil, Lactic Acid, Dipalmitoylethyl Hydroxyethylmonium Methosulfate, Cetyl Esters, Cetrimonium Chloride, Glycerin, Behentrimonium Methosulfate, Phenoxyethanol, Citric Acid, Amodimethicone, Behentrimonium Chloride, Polyquaternium-6, Isopropyl Alcohol, 2-Oleamido-1,3-Octadecanediol, Ci 77007 / Ultramarines, Trideceth-6, Chlorhexidine Digluconate, Benzyl Benzoate, Benzyl Salicylate, Benzyl Alcohol, Silica, Limonene, Linalool, Parfum / Fragrance. C212705/2.